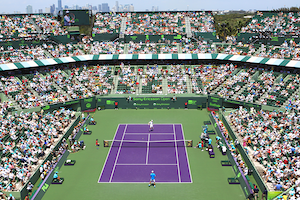 One of the star matches on Stadium Court at the Miami Open featured 2014 Wimbledon semifinalist Grigor Dimitrov against promising prospect, Vasek Pospisil. For the Canadian who ousted Juan Martin Del Potro in the first round, it was a miserable day at the office. Dimitrov required only 59 minutes to dismantle his opponent 6-2, 6-2. The ninth seed came out of the block blazing converting on double break point in the opening game. Dimitrov went on to cash in on another break point in the fifth game to take a 4-1 lead. The Bulgarian closed out the first set with ease with a love hold. Unfortunately for Popisil, the second set offered more of the same. Leveled at 2 all, the Canadian surrendered his serve by double faulting. After Dimitrov consolidated, Pospisil dropped serve his next game. Without fanfare, Dimitrov sealed the match on his first match point. In the third round, Dimitrov will battle John Isner. The American had a comfortable 6-3,6-4 victory against reigning junior world number one, 17 year old Andrey Rublev. Earlier in the afternoon, in a hold over from last evening rained out session, the affable Frenchman Jo-Wilfreid Tsonga tussled with American Tim Smyczek for a spot in the third round. The 2008 Australian Open finalist who was on forced sabbatical due to an arm injury held off Smyczek 6-4,3-6,6-3. Tsonga was satisfied with his performance considering this was his first match in few months “I didn’t expect to play my best tennis today ever. I’m happy the way I managed. . .I played pretty solid. I just had a little hole in the second set, it’s normal when you haven’t played since couple of months”. Next for the world number eleven is compatriot Gael Monfils who skipped Indian Wells this year due to a knee issue. Monfils dug deep against Filip Krajinovic in the tiebreaker after wasting a few match points to win 3-6,6-2,7-6. On Grandstand court, 2014 U.S. Open finalist Kei Nishikori routed Mikail Youzhny 6-2, 6-1. Fifth seed Milos Raonic and 2013 Miami finalist David Ferrer also crushed their opponents to book their safe passage into the third round. Other winners today include young American Jack Sock, Juan Monaco, Belge David Goffin who schooled 18 year old talent Borna Coric and Fernando Verdasco. © 2019 Miami Tennis News.com.